Celery is a long-season crop that grows best under cool conditions (60°F to 75°F ) with an ample and uniform supply of water. Although this crop will withstand light frosts, bolting (premature seeding) will occur if temperatures below 40°F persist over a period of 10 to 14 days. Celery should be seeded 8 to 10 weeks before transplanting in the field. Keep greenhouse temperatures above 55°F to prevent bolting and ensure continuous development. 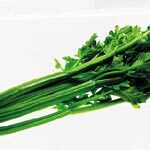 A deep, loamy and fertile soil with an abundance of available moisture is ideal for celery. Irrigation is necessary on sandy soils. Even though most of the celery root system is within top 6" of soil, many roots penetrate as deep as 2 feet; thus, heavy clay soils are unsuitable.